Let the guests of your next costume party, especially kids roam the party like a true pirate with a single eye patch made from this printable pirate eye patch template. Follow the printing and finishing instructions for a great free accessory. Complete the pirate party supplies kit with party hat, centerpiece, patches and other pirate items. Perhaps you can search for a free printable parrot to be printed and colored to complete the set. Parrots love to sit on pirate shoulders. When you want to create a great party atmosphere, print these templates onto light colored card stock or shiny paper for different textures. You can keep your kids busy doing pirate crafts for hours by choosing several templates from the miscellaneous printables party kit selections. There are a variety of free printable templates that can be customized for many different occasions such as Halloween or the study of historical events. Just follow the simple instructions and you will have your personal copy in minutes. Use these over and over. Asking the student if want to choose their own party kit pirate eye patches makes the party even more fun. If you decide your students are ready for a historical journey, try using printable party kit pirate eye patches for a fun way to explore the historical seas. 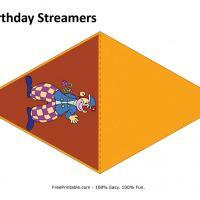 You can print these party supplies as many times as you wish for free. 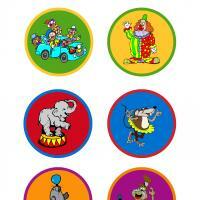 You can ask kids to find stories about these famous pirate icons. Search the site for more ways to centerpiece pirates for your students or guests. Your students will have great fun making a classroom paper representation of these sea captains. Why were these six designs chosen? How long did pirates roam the seas? Find these answers and more today. 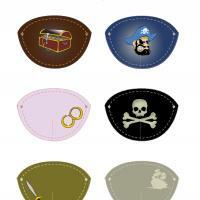 This pirate eye patch set is a free image for you to print out. Check out our free printable party supplies today and get to customizing!